Brussel's premiere business event the European Business Summit has grown. 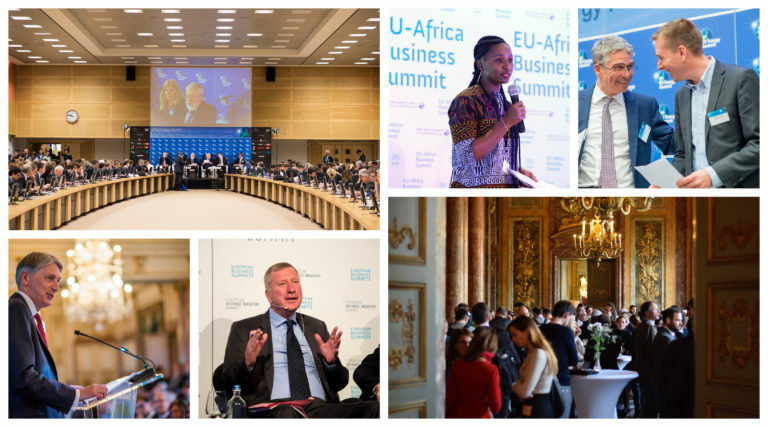 Using the tried and tested recipe for our flagship event the European Business Summit, EBSummits has grown to include events that deal with a variety of subjects: from European Defence to EU-Africa relations. We can’t wait to show you what we are up to next. European Business Summits is a well-known organisation which creates and supports networking and debating events in Brussels, including our biggest and most prestigious event – the annual European Business Summit. Our principal goal is to bring business and politics together and stimulate thinking on the most challenging European issues. Through its events and publications, EBS delivers an inspired and informed contribution to policy-making in Europe. EBS is supported by the FEB (Federation of Enterprises in Belgium) and BUSINESSEUROPE. The EBS is also proud to acknowledge the high patronage of His Majesty the King of the Belgians. Our mission is twofold: we aim to bring politics and business together in order to provide them with an opportunity to debate and pursue their common goals, giving a voice to all sides of the debate. The other priority of EBSummits is to provide a platform where business and politics can place their top priorities in the spotlight through discussion and debate with a variety of actors and stakeholders. EBSummits is proud to provide the platforms for politics and business to discuss, debate the key issues facing Europe. We offer a variety of events, tailored to different topics, and bespoke events according to our Partner’s needs. EBSummits has spent years gathering a network of high-level influential people to debate the key issues facing Europe right now.